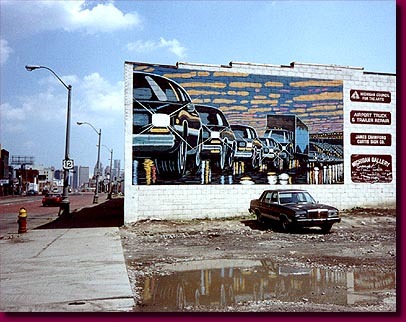 Near the Michigan Central RR Building along Michigan Avenue, I painted this mural in 1988 in cooperation with the then existent Michigan Gallery. The painting was to form a reflection of the incoming traffic on Michigan Avenue and the nearby Jeffries Expressway from which it was visible. It was painted over in 1996.